My brother-in-law frequently mentions how many parades happen in the city of St. Louis. 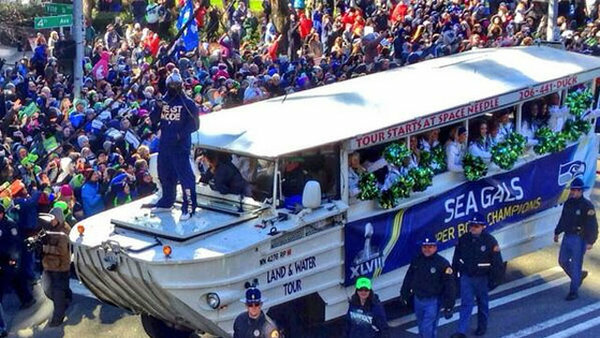 The City of Seattle has a lot of little neighborhood parades with Seafair, and one big Torchlight Parade. I saw something today that estimated the normal Torchlight Parade attendance at 100,000 plus. Nor should I ignore that Ashlan has participated in smaller parades, Macy’s and Torchlight as a princess. Today’s parade was short by comparison but eclipsed the attendance levels by multiple magnitudes. Yesterday early they were expecting 300,000. Then 500,000 this morning. 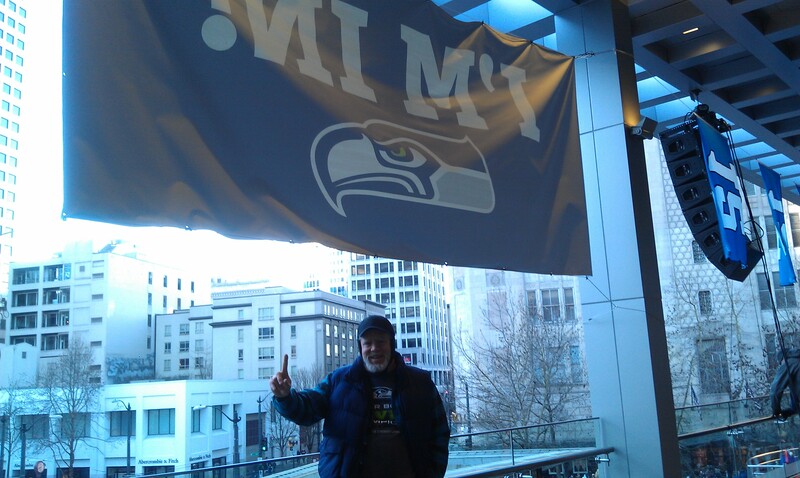 At the parade I heard there were 700,000, and then in the Victory wrap-up in Century Link field they said it was over 1,000,000. 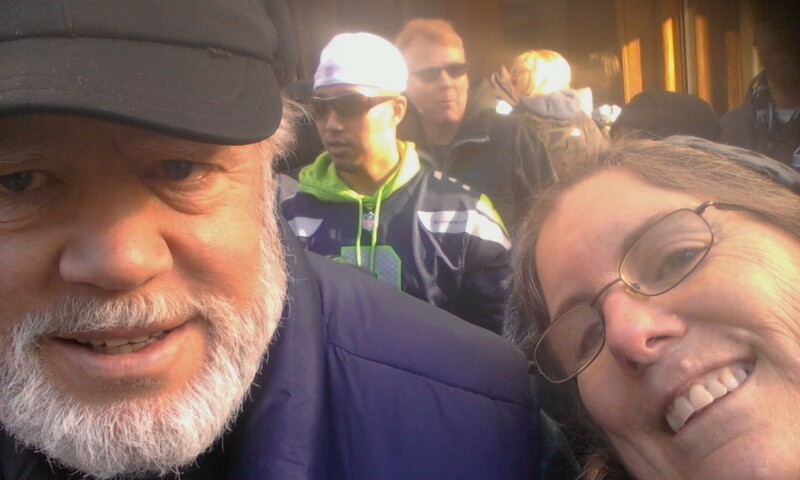 There was the parade, and the celebration at the football stadium, Century Link, and the overflow viewing (on the largest screen in the MLB) at Safeco Field. 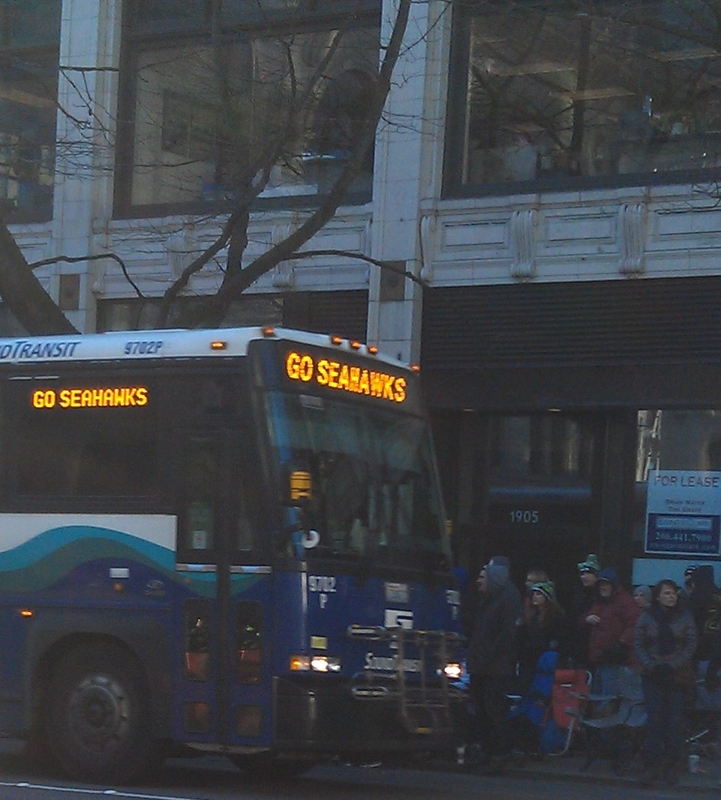 You had to be a Seahawk Season Ticket holder to get a ticket to Century Link. You had to be a Mariner Season Ticket holder to get a ticket to Safeco. 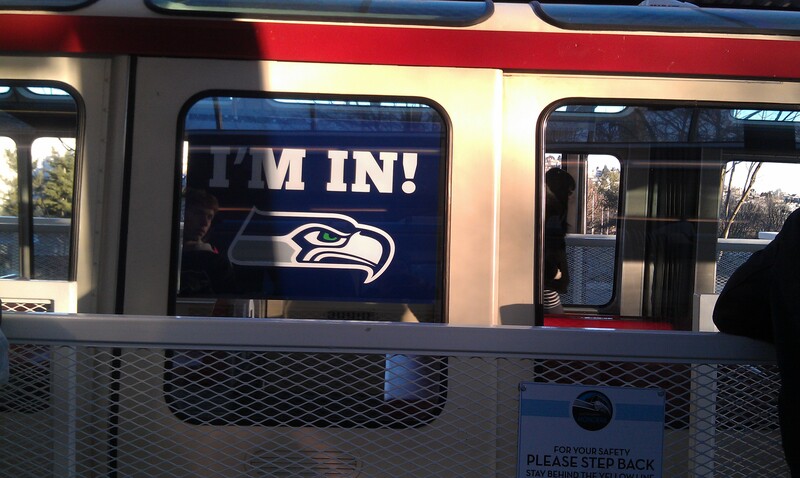 I started trying for a Safeco ticket about 4:30 PM – not too long after they were available. I watched the spinning circle on the screen as I worked on other items. I finally left work around 7 PM (carpooler issue), and started over trying on the home computer. About 10:40 I got through to request tickets. 4? Not available. 3? – YES – just print this set of tickets. This notice was followed by an hour of frustration as the pdf provided by Ticketmaster was apparently corrupted. The bar code would fade in and out, and would not show up on the print-preview, and when I tried to print anyway it said there were no pages selected to print. I tried to get back into my account and start over again, but it just indicated the tickets had been printed. Bulls***. But then I had a moment of clarity that said this was supposed to be fun – tickets be damned. We would just go it with the masses. We were supposed to rendezvous with 3 others downtown. As we were coming into downtown, the third bailed. In the end it was a lot easier to be making decisions on our own, but I am sorry they missed the experience. 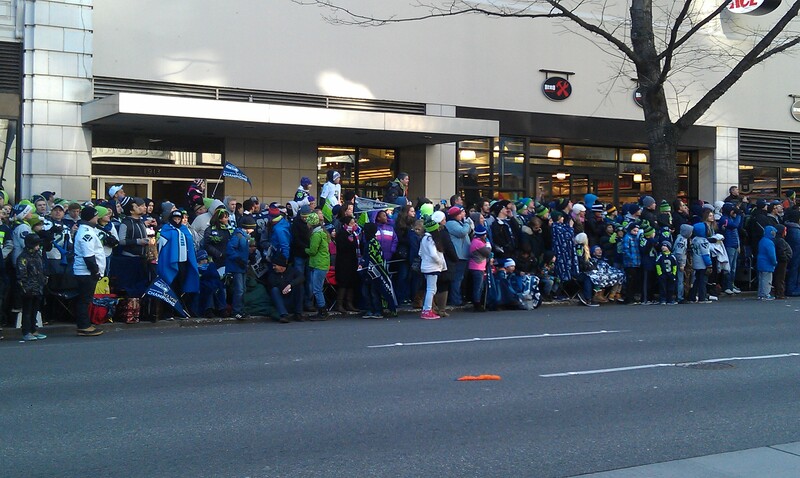 The first thing all those people had to do was get to downtown. We drove. 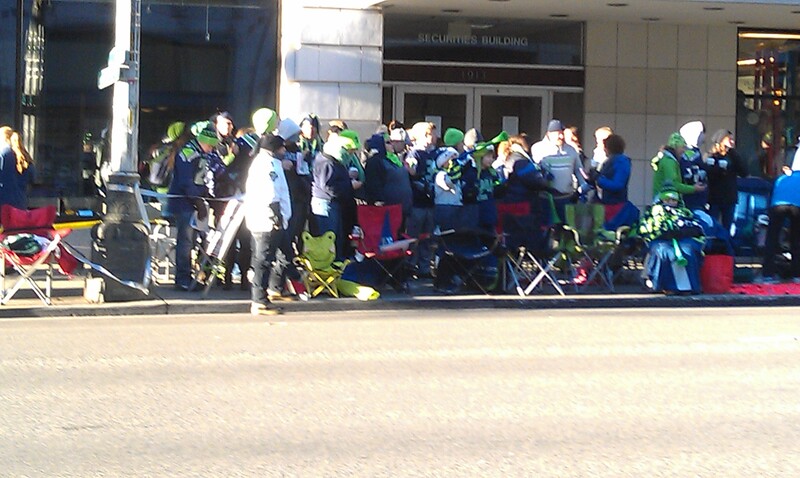 A bit early, but no where near as early as those that moved couches in or camped overnight. 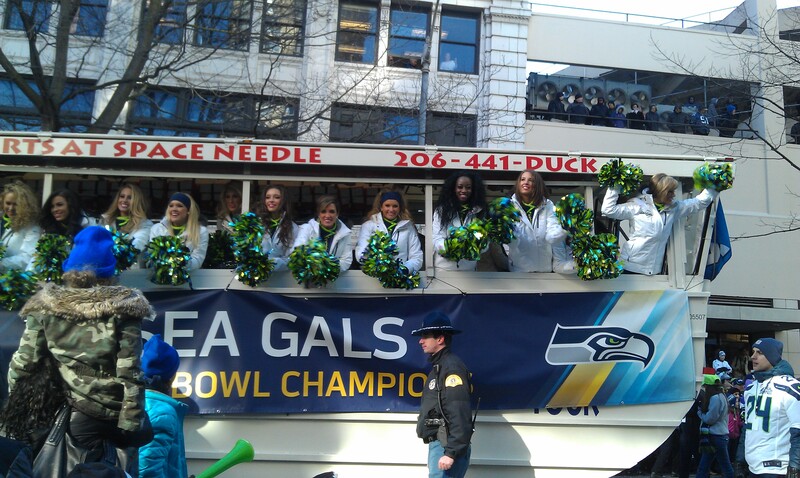 Our parking location was in a Seattle Center lot, not too far from the start of the parade. We have a monthly pass for this lot via Carl’s day care parent (he and Sagan spend a lot of time at the Seattle Center). As we arrived it was clear that they were using this parking lot to park police vehicles. It was directly adjacent to the law enforcement staging area. We found out later that the players staged at the EMP (Experience Music Project), also at the Seattle Center. We arrived in the downtown core a bit before 9 AM. By Monorail. It was probably 20 degrees. I’m not really sure of the exact temperature, but it was cold. I broke out the hand-warmers right away. 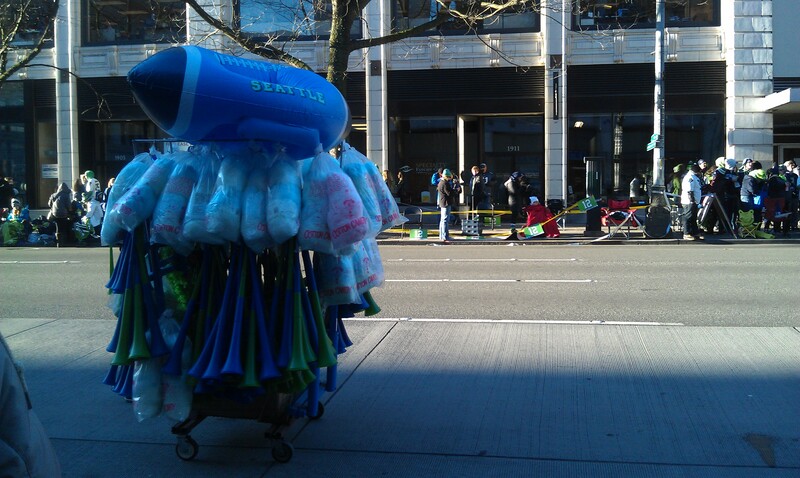 This was the view across the street – from when we arrived, until the parade was supposed to start. We had arrived early enough to score a pretty good spot. It pretty much guaranteed that we would not have somebody standing right in front of us. Carl could feel the crunch more than I did, because he ended up standing behind me. The couch moved from the curb, into the street, was folded from the hide-a-bed out to hide-a-bed in, and finally stopped about 1 foot in front of the curb. So I was at street level, and Carl was on the curb. The sun started across the street, moved to our side, came in and out of building’s shadows. It did help to have the sun warming here and there, but it stayed cold throughout. This vendor provided a bit of entertainment. 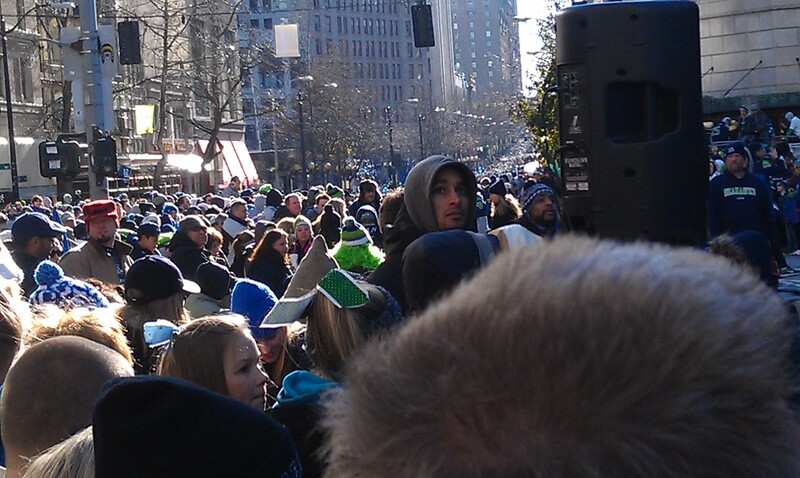 We saw him at the end of the parade, and he was almost out of everything. The crowd just continued to grow. At about noon I heard they had asked people to stop using their cell phones. The cell towers were overloaded and they were concerned about missing 911 calls. I did notice that the one text I tried to send failed to go through. And then there was the problem of my phone battery dying. It does not last a full day – not even close. I turned off the GPS to try and conserve power. FINALLY it was parade time – 11 AM. The crowd was ready. But apparently the parade was not. At 12:12:12 there was a Governor decreed moment of NOISE (30 seconds is apparently a moment). The first picture I had from the parade was at 12:33, and we were near the start of the route. And the phone was in Yellow power phase. After a few team dignitaries (Paul Allen, etc) the first player arrived. Marshawn Lynch – throwing skittles (and catching fresh packs). 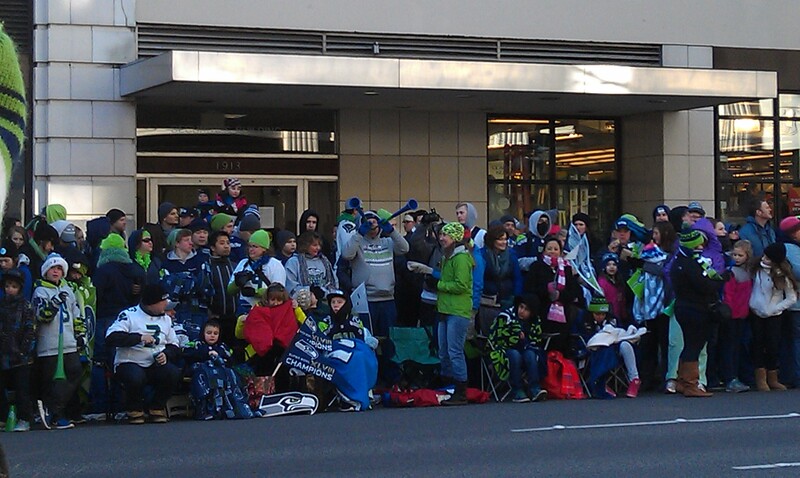 The following picture is not mine, but from the King5 site. This is just better. The Ducks and Military style Humvees each had a team group. 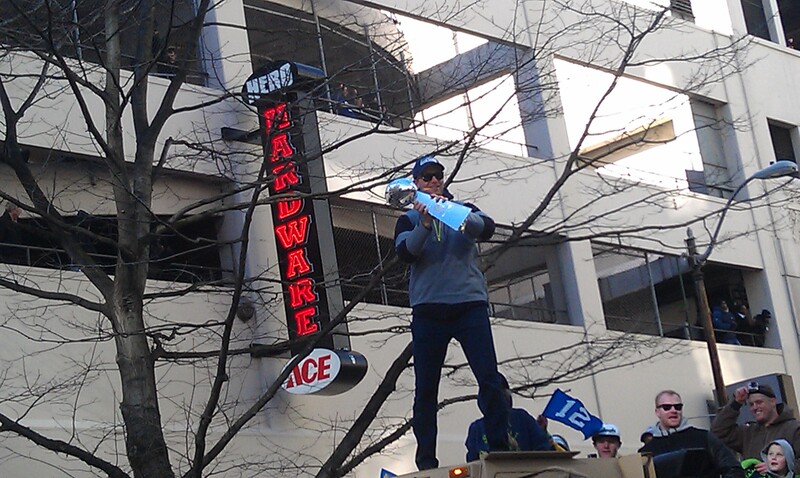 The Lombardi Trophy was with the Special Teams group. And not too long after this picture the phone decided it was time for a power nap. 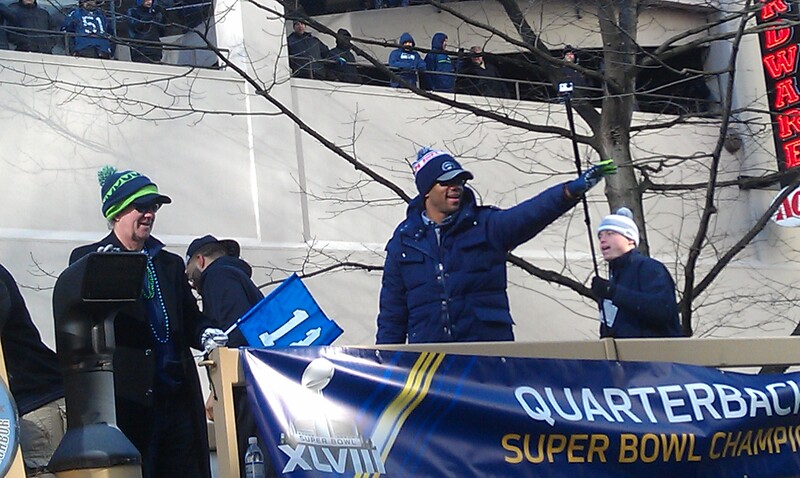 I missed getting a picture of Richard Sherman. At the end of the parade we had to figure out whether our limbs would still work. The parade continued to wind its way through the crowds. We returned to our car, and drove home (it was crowded driving as well). 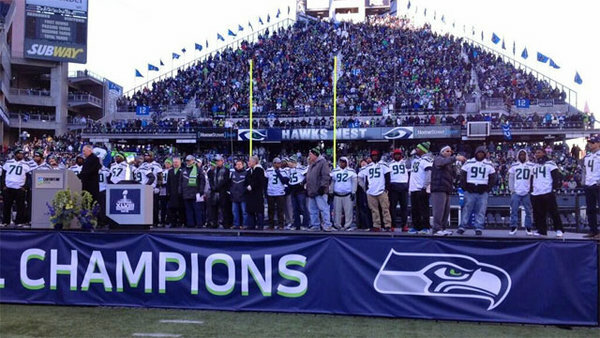 We easily got back in time to see the Century Link ceremony on TV. In a warm house. Trying to warm up. And I am still trying to warm up. I changed clothes to just change the dynamic, but have 3 layers on top again. So in the end, not adding a Safeco Field viewing into the dynamic was probably a good thing. This entry was posted on February 5, 2014 at 6:42 pm and is filed under Uncategorized. You can follow any responses to this entry through the RSS 2.0 feed. You can skip to the end and leave a response. Pinging is currently not allowed. I loved the play by play since I had to work. (not sure I would have wanted to be out in that cold anyway) Still, WHAT AN EXPERIENCE. *sniff* Wish my husband could have been here to see it.